I remember being about four years old, maybe five, the first time I wanted to go on a diet. I’d heard the influential adults in my life talk of their own diets. They had to change their eating habits for a short period of time in order to shed a few pounds. This was the basic structure of dieting as I understood it. Eat less, lose weight, be happy. So I gave it a try one day. I decided I was going to go on a diet, too. Because that’s what all the cool adults did. I felt so proud of myself. I remember sitting at the kitchen table eating an apple at snack time. I had asked my grandmother for fruit instead of what I really wanted — cookies. I’d heard an adult say that fruit and vegetables were healthy, which must have meant they’d be great diet food. I was feeling pretty pleased with myself as I ate my sliced apple. 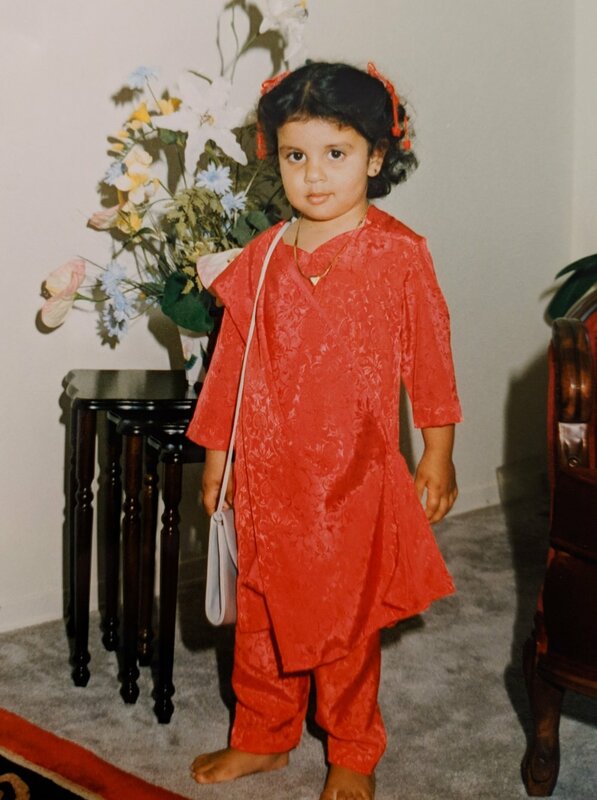 Me at 3 or 4 years old, very pleased with my very grownup purse. Later in the day, after dieting for a few hours, I decided to reveal to my mom what I’d been up to. “I went on a diet!” I told her, my chest puffed out with pride. My mom dismissed me, waved me off with a “good job.” I told her how “good” I’d been at dieting, telling her that I didn’t even eat when I was hungry (meaning, I didn’t reveal to any of the adults in my house that I was hungry so that they could feed me). I saw my mom’s demeanour change. An unhappy look flashed across her face. She told me I have to eat when I’m hungry. There was no arguing about it. And so, my diet was over. I noticed my body changing around the age of 7 to 8 years old. There was suddenly more flesh on my body and my tummy was a bit rounder. I was nearing puberty, but I didn’t know that. All I knew was that my body was changing and I was suddenly becoming part of a club of women that had to act and dress a certain way because they didn’t have perfectly flat stomachs and toned thighs. “People like us can’t wear clothes like that,” I was often told. “Like us” meant fat, overweight, undesirable. Me at about 8 years old, walking in a mall fashion show. I wanted to take home this entire outfit. I really loved denim. I was 8 the first time I was told to lose weight. It was said in passing, almost as a joke. But I remember it. That feeling. Suddenly, I wasn’t enough anymore. I was cute, but chubby. And chubby wasn’t a thing to want to be. My adolescent years were full of hiding behind baggy clothes. The bullies didn’t help. I was overweight but I certainly wasn’t obese. I didn’t take up nearly as much space as I thought I did. But when I looked in the mirror, I was disgusted. Because I was taught to feel disgusted by my own body. I was told that anything above a size 6 was overweight and unacceptable. I was told that my own body, the very thing that gave me life, was unacceptable. Being fat was unacceptable. I thought my fatness, however much or little fat I had, would stop me from all the good things. Every single one of them. 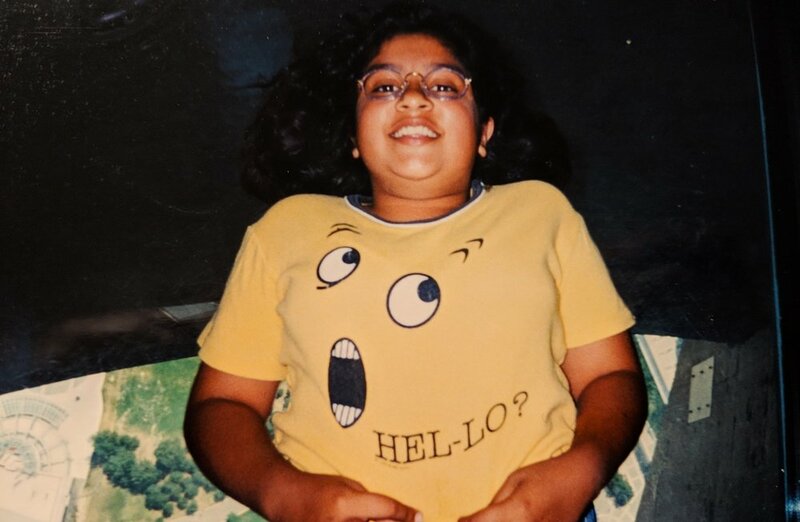 Me at 11 or 12 years old while lying on the glass floor at the CN Tower, wearing my favourite t-shirt at the time. I thought I deserved my unhappiness. Because how dare a fat girl be happy! How dare she be vivacious! How dare she have a zest for life! As a young adult, not much changed. I was uncomfortable in my own skin. I rejected any kind of healthy habit, because how dare the world tell me to change myself! I was angry. At everyone. Mostly at myself. But in the last decade, something changed. There was a shift. In the way I saw myself, in the way I saw those that made me feel lesser, and in the way I was constantly being told that my value would never match that of a woman with a 26-inch waist. I was much angrier than before, but not at myself this time. I started to see myself a bit differently when I looked in the mirror. I didn’t mind the flesh on my cheeks as much. And my dimple-clad thighs were suddenly kind of cute. In a world that told me every single day that the way I looked was wrong, I started to see just how right I was. The problem was never that I hated my body. The problem was that so many other people were offended by my body. The fact that I could still run, dance and enjoy my life, while looking damn good as I did, offended a whole lot of people. That I could dress well, wear mini skirts, and paint my face in whatever colour I chose, offended people. My very being offended people simply because I have fat on my body. 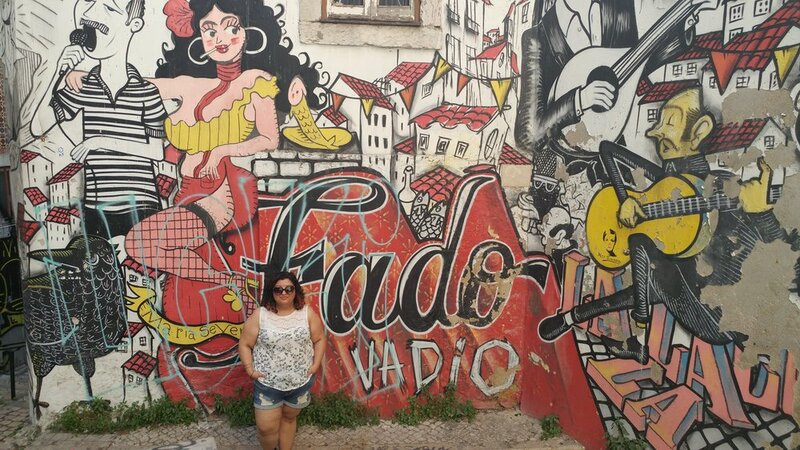 Visiting Lisbon, Portugal in May 2018. It’s taken me a long, long time to get to where I am now. I’m not hiding my arms, I’ll rock a crop top, and I might even throw on a bikini. Because I no longer care who I offend. I no longer care if my body feels offensive to someone. I do not live my life for those people. Those people are the tiny blips I’ve encountered on my journey to loving myself. Now, they’re specs in my rearview that no longer have any hold over me. You are beautiful. You are a stunningly radiant creature who brings this world so much love and light. Your body is something to be loved. And it deserves all the love. And I hope, if you don’t yet, that you will some day be able to show yourself and your body all the love that you need and deserve.